Other ingredients: vegetable cellulose, magnesium trisilicate, silica, magnesium stearate. 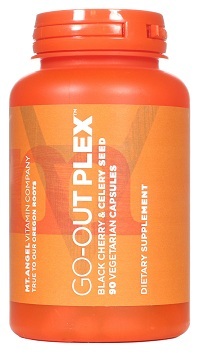 Go-out Plex is useful for uric acid metabolism. If pregnant or breast feeding ask a health care professional before use. Celery seed may cause photo sensitivity. Use sunscreen or stay out of direct sunlight while using this product. The germ fighting power of oregano for respiratory support. Everything needed to relsx blood vessels. Enhanced support for upper respiratory health. Especially for those who can't swallow pills.